Natural disasters have a direct impact on sustainable development and countries’ debt rate; therefore a robust mechanism should be in place during a catastrophe to effectively mitigate the impact of natural perils and to continue with economic activities to maintain the production levels. 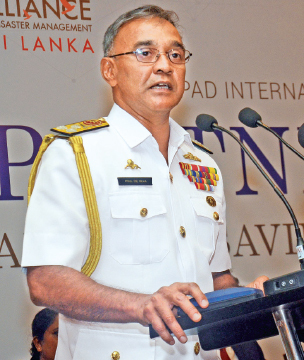 These sentiments were expressed by Vice Admiral Piyal De Silva, Commander of the Sri Lanka Navy at the Asia Pacific International Symposium held in Colombo yesterday under the theme ‘Partnerships – A Catalyst in Saving Lives and Businesses’. Speaking further, he said in developing countries, the continuity in economic development can be achieved by encouraging communities to engage more in disaster resilient businesses. He said there is a direct impact of climate change on economy and the affected countries have to bear up the economic losses and damages caused due to these disasters apart from the loss of lives. “Many countries in the Asian region are more prone to climate changes and as a result a considerable percentage of their GDP is lost due to these disasters and to deal with this, civil military partnerships in disaster response, relief and recovery efforts should be a collective approach and resources should also be used in an effective way to ensure return on investment.” he said. He said that natural disasters have impacted on humans since the known days of civilization and have influenced,shaped and modified the human behavior and even changed the way people think about disasters and the way they deal with such disasters by responding to the environment. “Disasters and disaster relief measures are discussed at large if you refer the statistical data in United Nations International Strategy for Disaster Reduction. Natural disasters may strike at any part of the world at any time or in any form causing significant damages to the economy, society and sustainable development at large. Therefore effective disaster management is necessary for every country,” he stressed. He said flooding is the most frequent natural peril when compared to all the environmental hazards in the world. Floods of various types and magnitudes have occurred in many countries in the Asian region, causing annual losses in terms of damages and disruptions to economy, livelihoods and businesses, services, infrastructure and public health and so on. “Frequency of disasters faced by the nation has also rapidly increased and among the disaster prone countries in Asian region, Sri Lanka is also in forefront and is frequently impacted by floods and landslides, causing irreversible damages to the human lives and property,” he added.